Often I want to configure an APEX page based on how many rows have been returned in a (typically classic) report region. There are a number of methods for determining this row count, and some have advantages over others. 1) Computation while rendering the page. This often isn't best for performance & maintenance since you effectively need to do a count(*) over the SQL you already have. And remove the column from sight of the user with the following CSS. 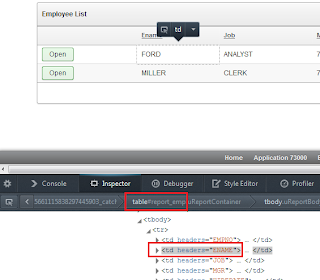 You can't declaratively set it hidden otherwise you cannot reference it with jQuery. You can then use this jQuery to return the count. It returns the text value of the CNT column from the first row. If you're using pagination on a classic report you can include substitution strings such as #ROWS_FETCHED#. Trouble is these don't get updated as you paginate through your results, and are usually only handy when operating with one page of results (or no results). Then the "No data found" and "More data found" message attributes can come into play. This method will work regardless of pagination usage. All you need is to identify something in your report you can count. , and nominated to count the number of employee name cells. Press the "Show count" button on my sample page to see notification of row count. Change pagination to see varying results. I'm really starting to love jQuery. Hi, please, can you send the application code?